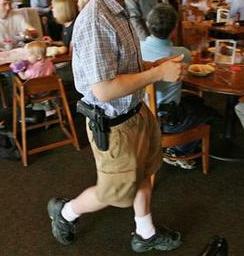 Someone stopped by looking for information on “Open Carry in Arizona”. I often get people curious about this from other States as well. So I am posting a list of States that currently allow “Open Carry”. Gun Control – Do We Really Need It? I couldn’t believe it the other day when someone whom I thought knew me, asked me, “So how do you feel about Gun Control? Don’t you think we really need it?” As if she didn’t know my answer to that!? Looking back I now think she was just trying to get me going, but that’s OK too. But as for Gun Control, let me put it this way. Another great blog that I link to here, Extrano’s Alley, has this prominently displayed on the top of his front page and it pretty much sums it up. There are more than 22,402 restrictive gun laws in force. Of those, not even one has ever reduced crime. In fact, crime has increased after each of these laws, and the amount depends on the severity and level of enforcement of the law. The fact is, (borrowing from the great movie with Humphrey Bogart, “Sierra Madre”) we don’t need no stinking badges – to carry our guns. I added the last four words, but what I mean is we shouldn’t need no stinking permit to carry a gun, concealed or otherwise. We shouldn’t have to show good cause to be able carry a gun, concealed or otherwise. Let’s face it, criminals certainly don’t feel they need a permit to carry a gun when they are a committing a crime. They’re already breaking the law. Why should they worry about a stinking gun permit. 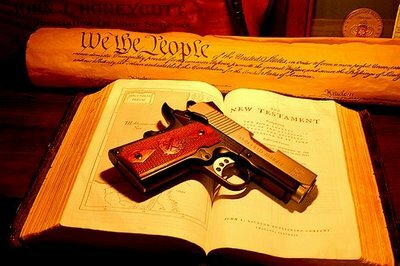 We already have the only permit we should ever need in the Second Amendment. Our Founding Fathers gave us the right to carry guns and they recognized that it was a right that should never be taken from us lest we see ourselves as subjects of a tyrannical government. Our Constitution was written to restrict what Government can do – not restrict what citizens can do. Just what part of “shall not be infringed” do you not understand? And yet, every year, legislators devise some new way to infringe upon law abiding gun owners and restrict their gun right. These same legislators took an oath to “support and defend the Constitution of the United States”. But with every new Gun Control law they are further destroying the Constitution. With every new Gun Control law they are violating that sacred oath and deliberately shifting the balance of power into THEIR hands and into the hands of the criminals. That quote I placed above is probably a little old in that there are many more than 22,402 restrictive gun laws in these United States. There are more laws every year, especially in California and New York – and Illinois, and Massachusetts, but I digress. But not one of those Gun Control laws has ever stopped a murder, a burglary, armed robbery, car jacking, sexual assault – again I could go on. Gun Control laws do absolutely no good to anyone but the criminals, because they actually make their job easier. They only restrict law abiding citizens from being able to effectively defend themselves from others who have made crime their career choice. New gun laws do accomplish one thing in that they secure the liberal legislators in their seats. They appease their liberal base such that they will vote for them next time, confident that the same liberal hacks will continue to support ridiculous Gun Control laws. I used to think that these new laws they write and pass must at least make them feel good in that they must feel that they have done something positive to protect society and keep them safe. But any more I can’t believe that they could possibly continue to be that stupid. When all of the evidence flies in the face of that notion, how can they really believe something so ridiculous? Gun Control laws actually work to increase crime in every area or state they are tried. Every large population center that has strict gun control laws, has violent crime that is out of control and on the rise every year. It has gotten so bad that the crime statistics that they are reporting are deliberately cooked to try and show decreasing crime so they can continue support their absurd notions that Gun Control laws are working. Gun Control laws are against the law in my opinion as every one of them goes against the Constitution of the United States and the Second Amendment. Guns should always have a place in our Society or we will cease to be a free people. The only laws we should even consider might be restricting those who have mental disabilities and violent criminals, although the latter does absolutely no good anyway. But guns should never be in the hands of the mentally disturbed. Although, there is another problem, how do you find those people before they commit some insane act? Other than that, I believe the Gun Control laws we have now should be repealed. Every law abiding citizen should be required to own a gun and know how to safely use it. Crime in our country would amazingly become so much more infrequent that news bureaus would have to look other places for their news stories. Of course they are doing a lot of that now already by making up new false issues in order to further liberal bias. But that is another rant altogether that perhaps I will have to take on another day. The Governor of the State of Wyoming recently signed a law effectively making the State of Wyoming the fourth state to adopt what is called a “Constitutional Carry” law, which means that citizens are not required to obtain a special, government issued permit or license to carry a concealed weapon. Governor Matt Mead signed the legislation into law after the state’s House of Representatives passed the bill in a 48-8 vote several weeks ago. While there have been no significant developments in concealed gun carry laws in most other states, Wyoming now has joined the ranks of three other states who already have constitutional carry laws including, Arizona, Alaska and Vermont. A few other states, such as California, are actually looking to make their carry laws more restrictive in the wake of the horrific Arizona shooting that killed a Federal Judge and five other people. Gun law extremists miss no opportunity to exploit a terrible tragedy such as that to ramp up and advance their liberal agendas. However, Colorado and Montana are currently considering similar proposals to Wyoming’s in their state legislatures. House Bill 1205, currently in Colorado’s legislature has passed the House of Representative in a 40-25 vote. It has now gone on to the Senate where it has been endorsed by the Senate Judiciary Committee by an 8-3 margin. Colorado’s bill will make it legal to carry a concealed weapon without a permit. In Oklahoma, voters have an opportunity to approve an “open carry” law that would allow citizens to carry a weapon whether it is concealed or unconcealed, if they go through an approved state sponsored concealed weapons program. This bill was unanimously approved by the House Public Safety Committee which put it on a statewide ballot where its future will be decided by the citizenry. The push to expand permit free gun carry laws is coming from a increasing number of people who are concerned about being able to defend themselves in the face of a growing armed criminal element that would otherwise have an extreme advantage over unarmed citizens. It is driven by law abiding citizens who want the government to stay out of their face as they exercise their fundamental and civil right to own and carry property. 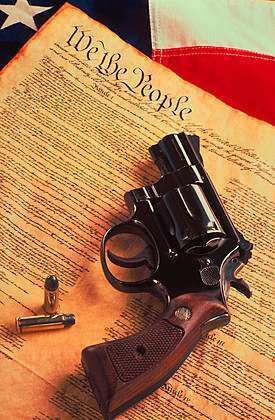 Arms, by the way, are the only enumerated property in the Constitution or Bill of Rights that you are guaranteed the right to possess. The recent rise of the Tea Party and other constitutional conservatives has fortified a movement to bring “constitutional carry” to other states, giving push back to the sense that many Americans have allowed gun control activists to steadily erode their liberties for many years. Legislators are recognizing that restrictive gun laws so far enacted have been unsuccessful at reducing violent gun crimes and more often exacerbate the problem. When faced with statistics that show violent crime rates fell in less restrictive gun law jurisdictions, they realize that taking the guns away from law abiding citizens is not the answer. People who neglect the exercise of their constitutional rights, may soon find those rights have been usurped by the State. First Arizona and now in Wyoming, the people are pushing back.